This Zmodo CCTV System is a 8 channel 960H from the seemingly-everywhere Zmodo brand. Yes they also make Funlux. Be wary that the price of this system does not include a hard drive. 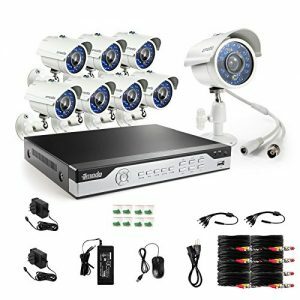 They can be bought extremely cheap, but if you want to forgo any formatting or compatibility issues you should purchase a complete all in one CCTV system. Yes the cameras will work without a hard drive, they just won’t record footage. There is a QR-Code scan code which will sync up to an app on your phone, tablet or wireless devivce. You can then conveniently stream footage and watch in real time. The 700TVL high-resolution cameras, creates one of the best pictures analogue cameras can produce. The DVR uses H. 264 Compression which means once you hook up a hard drive images will be compressed so you can store a lot extra, but the picture quality will not suffer dramatically. The DVR uses BNC & RCA connectors, plus a standard VGA input/output is also present for attaching a monitor. The bullet cameras use a 3.6 wide angle lensand they also have night vision functionality and have 24 LED’s each which allow up to 65ft of recording from the lens. The cameras use 1/4 in cmos sensors which are a step up from ccd chips. They result in a better image quality.